"Margaret O'Brien sails on SS Lurline. One neg. shows Child Movie Actress Margaret O'Brien seated in drawing room aboard SS Lurline looking at flowers. Almost grown-up, the 15-year-old star is sailing to Honolulu accompanied by her mother, Mrs. Gladys O'Brien and then they will fly to Tokyo where she will star in a film being made there. One neg. shows L./R. 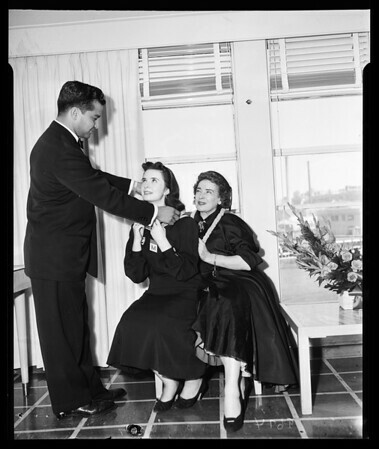 Ray Ortega, passenger agent, placing lei over Margaret O'Brien's head while her mother looks on. They will be gone four weeks".